Over the past week, I’ve been really struck by a number of comments from various women and what it says about their relationship with their husband. The comments were all phrased in terms of advice for me on how to protect myself and my belongings from my husband’s whims, carelessness, ‘jokes’, etc. The underlying theme of them all made it clear that their husbands do NOT view them as equals, do NOT treat them with respect, and do NOT behave in such a way as to establish and maintain trust with their wives. I am not singling men out here as being solely at fault. I think plenty of women are guilty of this too, and it is up to you (male or female) to demand and require what you expect from a relationship. Those behaviors would not be ok with either my husband or myself, since we work to foster mutual respect and a foundation of trust in our marriage. I ‘interviewed’ my husband before we got married about his feelings on these issues, and would not have married him if his views were divergent from mine on this vital issue. It is NEVER ok to treat your partner with disrespect. It is NEVER ok to deliberately behave in a way that erodes trust with your partner. It is NEVER ok to deliberately hurt your partner or their things in retaliation for some small slight – they burned the soup, they kept you waiting, they spoke with another person, etc. If you are not consciously working to keep your relationship strong and solid, you should probably evaluate why you are in that relationship to begin with. Don’t stay in a relationship where you are treated poorly, and NEVER believe that you deserve anything less than total respect – but make sure you are behaving in a way that entitles you to that respect. Sorry, I’ve been so crazed I haven’t had time to post. Honestly, I also didn’t know what to say. We are frantically packing to move out – have to be out of the current house by May 1, and rushing to have everything ready for the movers. Also frantically looking for new housing. If we don’t have something lined up in time, we’ll stay with friends until we find something, but GOSH it’s madness!! The real estate market here is so tight that it’s really hard to find places, and very competitive. But I’m really looking forward to the May 4th giant fabric swap and piling up boxes and bags of fabric to bring! What would like to swap for/with? I sew for a living, so I’m always looking for ways to make my work easier. You know how often you need to measure hem widths to fold over and iron, or mark other widths for other things? WELL! After a while of painstakingly measuring out the right width and marking it at 400 points along the way, I’d had enough. So I took some cardstock (you like the really pretty pink ombered card? 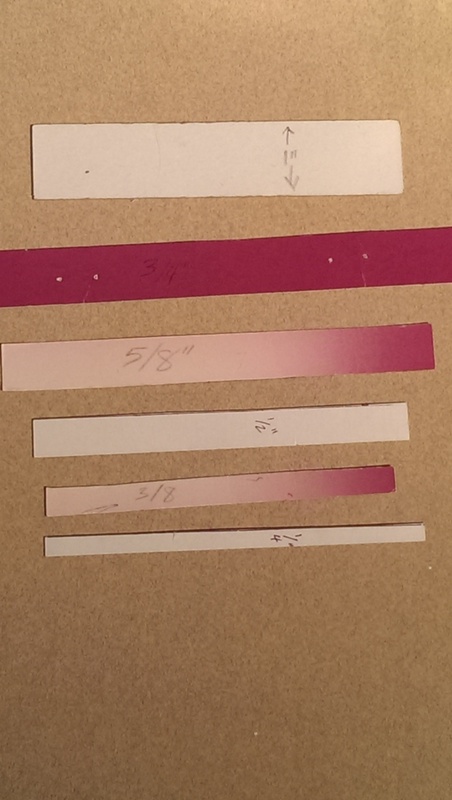 ), measured strips of the various widths I use most, and carefully cut them out (they’re nearly precise). Now I have a set of pre-measured strips that I keep in my notions drawer, ready to whip out. I lay one long side against the edge of my fabric, and run my marking pen down the other side, slide it along and repeat. Without having to check numbers, this goes SO much faster!!!! What tips and tricks do you use to make your work easier? I haven’t been posting because it’s been quite a busy week!! We have to be out of our rented house by the end of the month, so were looking for a house to buy in Seattle’s very-tight real estate market. In the process of lining things up, the credit report revealed that my husband had been the victim of identity theft! We check our report a couple times a year, but this happened in between our checks (make sure you check at least once a year!! Since you can get a free copy of your credit report once per year from each of the 3 credit agencies, that means you can request 1 every 4 months and stay on top of any problems or errors. If you find any, be sure to file a complaint and don’t hesitate to file a fraud alert if you suspect something.) That, plus some car trouble… Anyways, we are sorting all that out now and hope to have our own place set up by fall! Meanwhile, I’ve been having fun ‘dressing’ friends in shop inventory – doing my best to sell it off! Which leads to the advice in today’s post… When you buy a coat or jacket, or sometimes a skirt, if it has a pleat of some sort (kick pleat, inverted box pleat, etc.) or a vent, it is likely tacked shut with a criss-cross of thread. Also, it may have pockets which are sewn shut. Assuming there is a pocket bag, ALL OF THESE ARE MEANT TO BE RIPPED OPEN!!! The pockets should be ripped totally open so they can be used, and your garment will lay MUCH more nicely if those vents and pleats are opened to move freely. They are sewn shut to keep the garment nice and neat in packing and shipping, and so every customer who tries it on before you buy it and take it home doesn’t warp it out of shape jamming their fists in and out of the pockets. I can’t BEGIN to tell you how often I see this on the street and how ignorant it makes the wearer look. It’s the equivalent of walking around with the shop tags hanging off the garment. And while we are on the same topic, I can’t believe I need to point this out, but suit jackets and coats with the brand label sewn onto the sleeve… Yeah, that’s supposed to be removed as well! !